There was a Slug in my Lettuce! Not sure why people have been so negative, I have been in quite frequently in the last 2 years and think it's great. The food is good, their new drink and food deals are fantastic and the beer lines are kept clean. 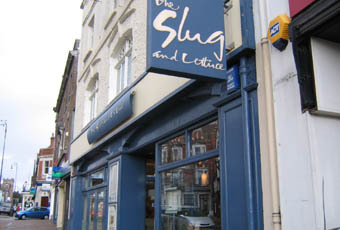 The staff are nice and it has a modern, comfy atmosphere. 9/10. Not visited myself, but two friends have recently been shortchanged or 'accidentally' overcharged. Check your bill carefully - and change ditto. Went for a few drinks after work. Found the beer to be so flat i left it so stick to bottles. The mens toilets were not good dirty and needing repairs. Went back here last night a few months after my last visit. Would not have gone by choice but some mates like it so I felt obliged and I had heard it had improved. Well, let me tell you right now it is just as crap as it ever was. All the draught beer tasted like someone had poured ammonia in the barrels. After giving up on beer we tried a bottle of wine which tasted of vinegar and domestos. Finally settled on very expensive bottled beer instead. It is filthy and full of scumbags (though to be fair most pubs in Tonbridge are the same). Staff are inattentive and will only serve you when they have finished serving their mates. If you have the gall to complain about anything they stand, open mouthed, and stare as if they want you to tell them what to do next. I will not go back again. If my mates go there when I am with them I will sit in the Castle opposite, have a decent pint and wait for them to finish. This place stinks. Close it!!! !